It was truly an electrifying night Wednesday, as the Blue Jays would face off against the New York Yankees for the final time of the regular season. 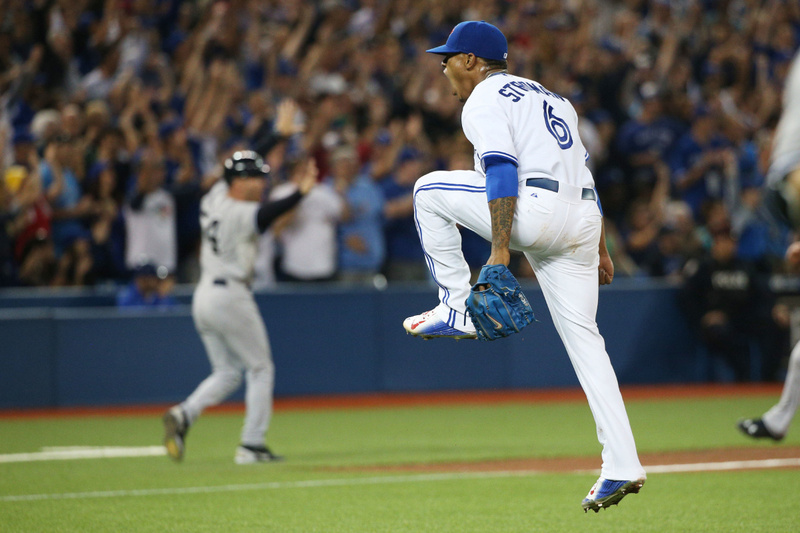 Marcus Stroman (2-0) would take the rubber for the Jays as the Yankees would send Ivan Nova (6-8). Marcus Stroman would continue where he left off from his last start striking out the first two batters. The Blue Jays faithful felt the energy in the air. They knew tonight was going to be the biggest night of the young starters career. The Blue Jays held a 2.5 game lead heading into the game, hoping to gain more ground on their AL East rivals. It would be a fast paced game as no runs scored through the first five innings. In the sixth, after getting a pair of runners on base, Kevin Pillar would single to center, scoring Russell Martin to go on the board first. Then in the seventh, Martin would be at the plate again after another pair of runners reached. That is where Martin would launch a three run shot into Jays bullpen situated in left field. That’s all the boys in blue would need as Brett Cecil and Roberto Osuna would come in and sit down the batters they faced. The Blue Jays 87-65 will have a night off Thursday before facing the Tampa Bay Rays (75-78) Friday to begin the final home stand of the season. R.A. Dickey will take the bump while the Rays will send Jake Odorizzi as the counter in hopes to play spoiler, for the blue birds. First pitch, 7:07PM EST.